As I have not used cloth face masks before I was slightly humoured by its appearance – even more so once I put it on and saw how funny I looked. Although the mask was cold when I put it on, it slowly warmed and was replaced with a pleasant tingling sensation. The liquid that the mask is soaked in has a velvety texture which is unlike any cream I have used before and it felt amazing on my skin. When I took the mask off, my skin felt fresh and rejuvenated and my pores looked noticeably smaller. The mask claims to assist in clearing spots and blemishes, however I believe one would need to use it several times before reaping the full benefits. At only R35, this mask is the ultimate guilt free purchase as it offers the spa quality without the steep price tag. I would definitely recommend this face mask to anyone – I liked it so much I have since purchased another mask in the Skin Republic range. I’m quite impressed with this mask. It leaves a soothing and cleansed feeling on my skin. My skin looks refreshed and hydrated with a beautiful glow. I love that it has the good beneficial properties of tea tree and witch hazel extracts. The mask itself is easy to apply, covering perfectly on the face. 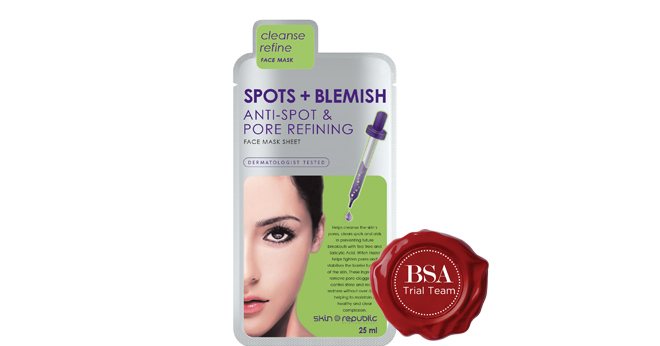 In order to see the full results as claimed with assisting in clearing of spots and blemishes in my opinion one would have to use several times. For the affordable price of R35 it’s definitely a steal. I would highly recommend this great product especially for sensitive skin. I personally will continue to use it. I am not a face mask fan but this product is a must have. It comes in a small travel size package which is flexible and soft and easy to travel with while the “tearing mark” makes opening the packet a breeze. This face mask is soft and super moist and feels almost like a wet cloth. There is no harsh chemical smell only a slight fresh smell that is easy on the senses. When first applying the mask it feels cold and wet (perfect for those hot summer days), but it fits around the face perfectly and soon feels nice and warm. The nourishing liquid definitely helped my skin feel and look more nourished and healthier (a must have for winter!). The mask was so drenched in the liquid that I managed to use it twice! This product is perfect even if you have sensitive skin. There are no harsh chemicals so it does not dry out or irritate the skin. I absolutely love this product and will definitely buy it. It is money well spent! I love the packaging of this product; it’s compact and light and could easily be slipped into your handbag and taken along on a trip. This mask comes in the form of a sheet; so it’s not too messy like other masks that are usually sticky. You can smell the tea tree extract as soon as you open the package; the smell is a bit strong but at least you know that the product contains the ingredients specified on the package. The first thing that I felt when I put on the mask was cold; this would be a great feeling on a warm summer day but not so good in winter; but after about 10 minutes it didn’t feel too bad as my skin got used to it; when 20 minutes was up I could feel a slight tingling sensation indicating that the mask had done it’s work. After removing the mask I could see a slight improvement in my skins appearance and texture; it looked and felt smoother. It helped remove the blackheads from my nose. I would love to try the Skin Republic Spots + Blemish Face Mask again and would recommend it to my friends. Spots and blemishes are at the top of the lists we as women face. Introducing the Anti-Spot and Pore Refining face mask sheet.The packaging was simple and and indicates exactly what the purpose ot the mask. It gives easy to follow instructions. I found it was easy to open on the sides as there was a ready to tear on either side. As I opened the mask was soaked what was said to be the skin fillers which will absorb into the skin. I followed instructions and easily applied the mask to my face. It was that easy. I immediately felt the moisture soak into my skin leaving a cool sensation over my face.It felt rather refreshing. I applied the excess serum to my neck. The mask sheet ladies, is not very flattering but it was worth it as I could feel a difference in my skin. After about 10 minutes my face felt tighter or rather the pores felt tighter. The product claims to clear spots and blemishes, cleans the pores and controls shine. Well I would say after continued use one would see the spots and blemishes clear. I would definitely buy this mask sheet again and would recommend it to anyone. The packaging is user friendly, very light so its also awesome when one is traveling, its easy to open and has clear instructions on it. The mask smells good, it has a nice light minty kind of smell. It was easy to apply and fitted perfectly on my face. Its soft, calming and cooling effect made me feel like I was at the Spa :-). After using it the pimples I had didn’t get bigger, some got smaller and I didn’t see any new ones after using it. No one has noticed a difference on my skin since I’ve been using it. I honestly loved how it made me feel and I would continue using it because I have sensitive skin and it was not harsh to it at all. I would recommend it to anyone who suffers from pimples and who wants to feel like they are in a luxury spa in the comfort of their own home. The first thing I did when I received the product was to feel it in the packaging (I didn’t think it was too fancy). I wasn’t quite sure if it would be the face masks it promises to be, but gosh I laughed when I saw it and used it. It is good to have the face mask on for a period of 15-20 minutes as the directions say to. It wasn’t disturbing at all, but it was funny. Iy felt so cold, but after a while it was okay as I got used to it. After I used the face mask, I felt so fresh. I couldn’t believe it resulted in my face feeling like the baby’s touch. My face was really smooth and clean and I feel in love with the product. My skin type is a combination on fry and oily (more dry). The face mask helped to soothe my dry skin. I only used it once, so I wouldn’t say it’s good for spots. I’M still looking forward to using it again as I enjoyed it and I would recommend it to other to try. The product has a fresh fruity smell that smells very nice. The mask is soft and smooth; the substance on it feels a little cold. The package opens very quickly; you just have to tear it. The packaging is very nice and the information on it is very informative. It is about A5 page’s size. It really relaxing my skin because I am also inhaling this nice aroma of fruity smells. This product helps to improve your spots and blemishes. I only used it this one time, but I could feel and see the difference after I had used it. My skin was nourished, but not oily and the redness of my spots was not there anymore. I would say that any person of any age could use this product to improve their skin, because acne and bad skin doesn’t stop at an age. I would buy this product and from what I have seen is that this particularly make has got a variety of mask for every skin problem.